Nippur (Sumerian: Nibru, often logographically recorded as 𒂗𒆤𒆠, EN.LÍLKI, "Enlil City;" Akkadian: Nibbur) was among the most ancient of Sumerian cities. It was the special seat of the worship of the Sumerian god Enlil, the "Lord Wind", ruler of the cosmos, subject to An alone. 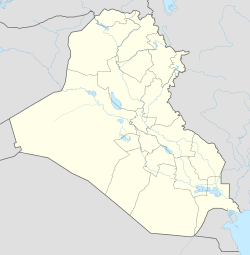 Nippur was located in modern Nuffar in Afak, Al-Qādisiyyah Governorate, Iraq. Nippur was excavated for 19 seasons between 1948 and 1990 by a team from the Oriental Institute of Chicago, joined at times by the University of Pennsylvania Museum of Archaeology and Anthropology and the American Schools of Oriental Research.